My name is Clifton Fulkerson, and I am the owner and operator of Salute Exteriors Inc. I live in Edmond, Oklahoma with my wife and two daughters. I take pride in serving our great state in the Oklahoma Army National Guard as a 1SG in the 45th Infantry Brigade. My background experience and knowledge in the construction industry has also allowed me to serve families directly as a James Hardie Siding Elite Preferred Contractor in the Oklahoma City area. When you hire Salute Exteriors, you can expect an insured, certified professional that guarantees satisfaction with every project. 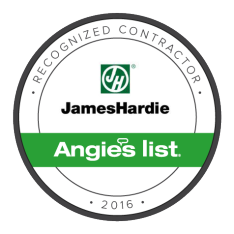 I can assure my jobs will be completed 100% to the James Hardie installation guidelines while using the best labor crews available in the OKC metro. This gives you the peace of mind to know that you have the performance and durability along with the manufactures warranty that you deserve. To set ourselves apart from other siding companies in OKC, Salute Exteriors upholds a reputation for a high level of client communication, clean job sites, and on-schedule project timelines. I hope that you consider us for your siding project. I invite you to contact me anytime to discuss how we can improve your home. We provide superior James Hardie fiber cement siding to Oklahoma City and Edmond homeowners to transform your home’s exterior. Take your home’s curb appeal to a new level with siding that will last a lifetime. When you trust Salute Exteriors with your new or existing home, you can expect the utmost precision, quality materials, and professional service. Start the process of re-siding your home. Contact us today for a free quote! Proudly serving Edmond & OKC metro homeowners. At Salute Exteriors, we serve our Edmond and Oklahoma City customers with James Hardie, the world leader in fiber cement siding. James Hardie will outperform all other brands. You are investing in a quality product that protects one of the biggest purchases you make in your lifetime: your home. House your family in a shell that is just as durable as it is beautiful and is designed to relentlessly protect against Mother Nature. Salute Exteriors is a Veteran owned and operated company, meaning we have a foundation built on integrity and professionalism. We are a licensed and insured Oklahoma contractor with unsurpassed craftsmanship and a passion for carpentry. You can be confident knowing that your home is in the hands of professional individuals that share your vision. Salute Exteriors meticulously evaluates every home to ensure our customers get exactly what they want. We take pride in keeping our promises and making your home exquisite. Get a ranch style home, cabin feel, high-class luxury look, or vibrant pop of color. No matter what look you are going for, we can provide a style that fits. After all, you deserve to love the place you call home.